Providing handouts to the wealthiest corporations on earth does not make much sense, particularly when their activities are the leading driver of climate change. Ending fossil fuel subsidies is the most obvious next step in our efforts to tackle the climate crisis. In the wake of the Paris Climate Agreement forged at COP21, continuing fossil fuel subsidies is an oxymoron. These subsidies take many forms including, tax breaks, cheap loans, price controls, purchase requirements, purchasing equipment, royalty breaks and direct spending. According to some reports there are over 800 ways that taxpayers support the fossil fuel industry. According to the IMF, global energy subsidies amount to 5.3 trillion dollars, or $10 million a minute. This translates to 6.5 percent of global GDP, in 2015 alone. This is more than the entire health spending of all the world’s governments. The IMF suggests that removing fossil fuel subsidies could reduce greenhouse gas emission by 20 percent. 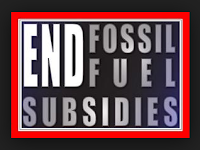 Everybody from Prince Charles to the IMF have called for an end to fossil fuel subsidies. The world's biggest providers of fossil fuel subsidies are China, ($2.3tn) US ($700bn), Russia ($335bn), India ($277bn) and Japan ($157bn), and the European Union ($330bn). Perhaps the most noteworthy statistic contained in the report show that in the absence of subsidies emissions would have been cut in half in 2010. Numerous other studies including IMF research have come to similar conclusion as the Policy School study. The IMF called these subsidies "unsustainable"." The IMF described these subsidies as "perverse" saying "they are using public funds to create a problem the world has agreed to fix in Paris. And they leave us all to pay the societal costs that fossil-fuel pollution causes." Ending the subsidies would also reduce the number of premature deaths from air pollution by half translating to about 1.6 million lives a year. In 2014, IMF leader Christine Lagarde said reducing subsidies for fossil fuels and pricing carbon pollution should be priorities for governments around the world. “We are subsidizing the very behaviour that is destroying our planet, and on an enormous scale. Both direct subsidies and the loss of tax revenue from fossil fuels ate up almost $2 trillion in 2011—this is about the same as the total GDP of countries like Italy or Russia,” Lagarde said. In 2009 the G7 (composed of UK, US, Canada, France, Germany, Italy, Japan and the European Union) announced that it would end fossil fuel subsidies but no timelines were given. At a recent meeting of the G7 in Japan, the world's wealthiest economies have agreed to end fossil fuel subsidies in the next decade. “Given the fact that energy production and use account for around two-thirds of global greenhouse gas emissions, we recognise the crucial role that the energy sector has to play in combating climate change,” said the leaders’ declaration, issued at the end their summit in Japan. "We're subsidizing companies to search for new fossil fuel reserves at time when we know that three-quarters of the proven reserves have to stay in the ground if we hope to avoid the worst impacts of climate change...So paying companies to find more fossil fuels is folly." The report was produced jointly by Oil Change International, an advocacy group focused on moving the world away from fossil fuels, and the Overseas Development Institute, the U.K.'s leading independent think-tank on international development and humanitarian issues. Despite numerous attempts to remove these subsidies in the US Congress (primarily the Republicans) have thwarted these efforts. The fossil fuel industry owns the Republican party who have consistently shown their loyalty to an industry that is rife with corruption and subterfuge. Internationally, the leaders from over 50 countries have made public commitments to phase out fossil fuel subsidies in the “medium term.” However there has not been much concrete action to date. Canada's total federal and provincial support for the petroleum industry was close to $2.7 billion US ($3.6 billion Cdn at current exchange rates) in the 2013-14 fiscal year, with federal subsidies accounting for roughly $1.6 billion. In his election platform, Prime Minister Justin Trudeau pledged his government would end fossil fuel subsidies. 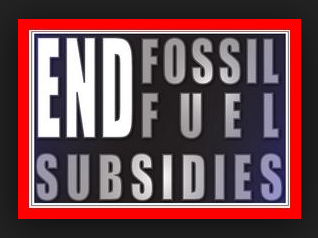 “Fossil fuel subsidy reform is the missing piece of the climate change puzzle. It’s estimated that more than a third of global carbon emissions, between 1980 and 2010, were driven by fossil fuel subsidies.